So That's How I Began! 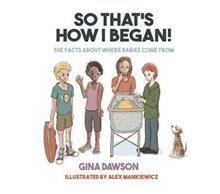 is a book to have on hand from the moment a child begins asking questions. It explains modern day families, body parts, natural and assisted conception, pregnancy and birth. Presented in an age appropriate and matter of fact style, the book encourages all-i... read full description below. So That's How I Began! is a book to have on hand from the moment a child begins asking questions. It explains modern day families, body parts, natural and assisted conception, pregnancy and birth. Presented in an age appropriate and matter of fact style, the book encourages all-important conversation from an early age and is entirely flexible - read it from cover to cover or simply jump to the part relevant to the child's question. Wonderfully illustrated and written in a warm, relaxed and inclusive way and with positive messages throughout, this is a book that both child and adult will be comfortable to read over and over. Author Gina Dawson taught sexuality and relationship education primary and high school for many years and knows how to present the facts in a way that is non-threatening and entirely comfortable. Gina wrote So That's What's Happening! in response to parents, teachers and caregivers continual requests for a book that was simple, accurate, straight forward and up-to-date book to introduce puberty to both boys and girls, and which was suited to younger readers as well as those who had already begun puberty.